Motorists are to have greater choice and flexibility as the DVLA announces plans to reform its customer services. Millions of motorists are set to benefit from greater choice and flexibility in how they deal with the DVLA under proposals published for consultation today by Roads Minister, Mike Penning. The proposals will make it easier for motorists to interact with the DVLA. This will be achieved by centralising its services and providing much more choice and flexibility, including online services, than is currently available around how and when motorists deal with the DVLA. The proposals could deliver significant efficiencies with an estimated £28million year on year saving. "This is a major step change which will make dealing with the DVLA easier and quicker for motorists and businesses up and down the country. Centralising the DVLA's services is the first crucial step towards making more of its transactions available online, allowing people to deal with the DVLA at their chosen time and place. This will mean quicker turnarounds and meet our customers' growing needs." Under the proposals, customers should have far more ways to access the DVLA's services than the 39 regional offices the DVLA currently operates in Great Britain. Today's announcement means that the 39 regional offices, 10 of which include its regional enforcement centres, are expected to close by the end of 2013, with work currently processed at those offices centralised at the DVLA's HQ in Swansea. As this proposed centralisation is expected to have an impact on resources, a separate consultation with the staff potentially affected will also begin today. "The DVLA has been serving motorists for over 40 years in one form or another. But times change and customers' needs change. That is why it's essential that we move with the times and make the best use of our services and experience to make sure we give the motor industry and the general public a service that is fit for the 21st century, allows them to carry out their business in a way that suits them and offers the best value for money for the taxpayer." 1. In summary, the consultation seeks views on transforming the DVLA's services to offer a wider choice to customers. 2. The DVLA became an executive agency of the Department for Transport (DfT) in 1990. Previously known as the Driver and Vehicle Licensing Centre, the organisation has kept centralised records of drivers and vehicles since the early 1970's. 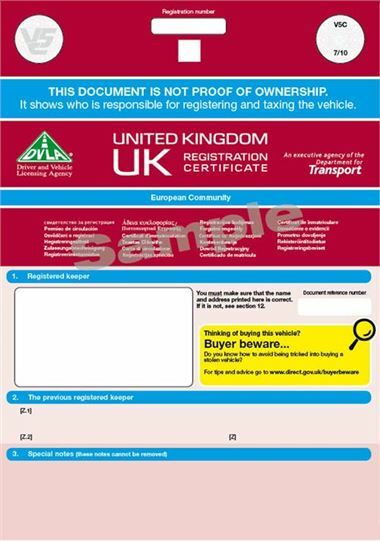 The DVLA is responsible for maintaining registers of vehicles (36 million) and for drivers (44 million) in GB. The DVLA supports law enforcement and helps deliver a wide range of road safety initiatives in conjunction with DfT and plays an important role in crime prevention and crime reduction through enforcement, prosecution and intelligence gathering. The DVLA is responsible for collecting Vehicle Excise Duty (vehicle tax) for HMT, with nearly £5.8 billion collected in 2010/11. 3. The DVLA employs 6,116 staff with 1,213 potentially affected staff employed in the 39 regional offices and in the 10 Enforcement Centres across GB. The 39 regional offices carry out a range of administrative functions such as arranging Trade Plates for garages, vehicle inspections and personalised registration mark transfers. The 10 Enforcement Centres carry out a range of back office duties relating to the DVLA's enforcement of offences which include failure to tax vehicles, having no motor insurance and for failing to tell the DVLA their vehicle is kept off the road. 5. The DVLA's 10 Enforcement Centres are co-located with some of the regional offices above and are located in Birmingham, Bournemouth, Exeter, Glasgow, Chelmsford, Leeds, Newcastle Upon Tyne, Nottingham, Preston and Sidcup.